"Knowledge and experience within the healthcare sector is clearly evident within the Maccabee agency. 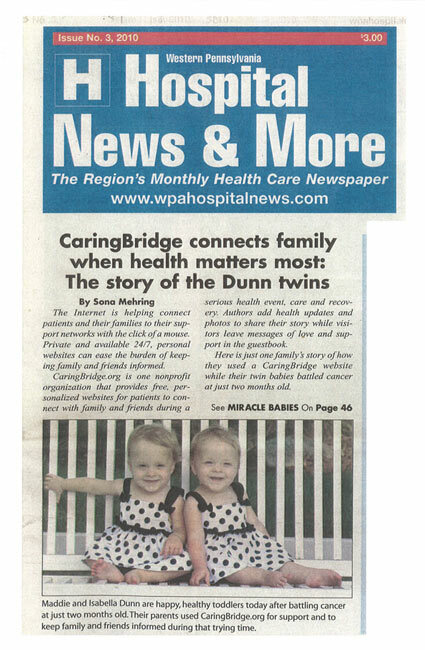 Paul, Christina and team brought great thinking to CaringBridge, that included custom research, content strategy, targeted media outreach and executive thought leadership strategy. With Maccabee’s guidance, CaringBridge was able to quickly lay out and effectively execute a three-pronged awareness strategy focused on health care thought leaders, hospital decision makers and clinical professionals." 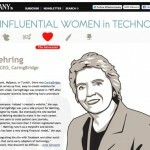 Before Facebook existed, CaringBridge was founded as one of the first social networks. 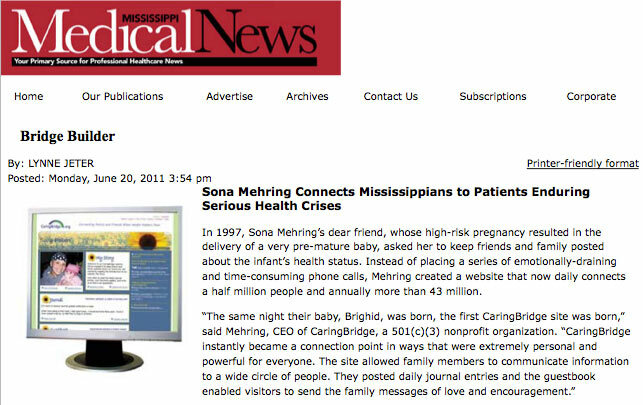 Its nonprofit mission was to offer free patient websites that would connect people experiencing cancer or other health challenges with family and friends. 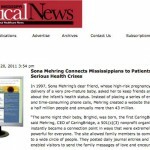 CaringBridge founder Sona Mehring was motivated by a friend who had suffered a life-threatening pregnancy and needed to quickly update loved ones during her struggle. Since 1997, more than one billion friends and family had connected with a loved one through a CaringBridge site – yet that number represented only a fraction of the people who could use the free service, if they only knew of its existence. Enter Maccabee, which leveraged powerful user stories, a survey revealing precisely how patients wanted loved ones to support them and Sona’s own personal journey to generate staggering media coverage. 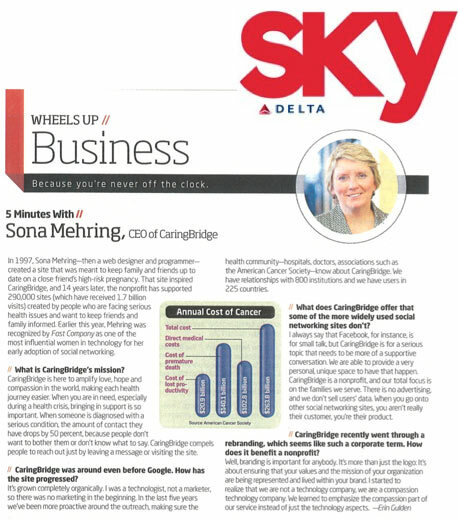 Results included mentions in “Caregiving in a Crisis,” published in AARP Bulletin, a column in Family Circle, and a full-color profile in the 5 million reader Delta Sky inflight magazine, which together brought the CaringBridge message to 22 million potential users. Maccabee also reached out to patients currently experiencing a health crisis through PR placements in CancerEducation.com, Heart Insight and Coping Magazine. 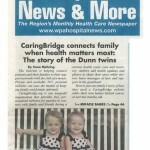 Maccabee connected the brand with healthcare professionals who serve as influencers to engagement with CaringBridge.org. From child life specialists and oncology nurses to social workers and physicians, Maccabee expanded awareness of the free service among “recommenders” with placements in medical publications such as Group Practice Journal, Caregiver’s Voice and Light Spinner Quarterly, a magazine for child life specialists. Finally, the agency elevated Mehring’s national visibility as a healthcare social media influencer. 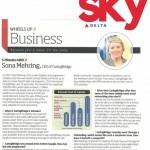 Maccabee helped Mehring obtain a seat on the CEO Panel at the 2011 Digital Health Summit, as well as thought leadership profiles in The Grindstone, ThirdAge.com and Social Media Club, and a video interview with WebProNews. 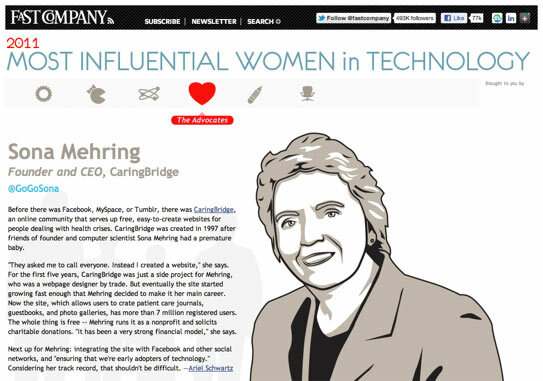 Maccabee pursued awards for Mehring, leading Fast Company to name her one of 2011’s “Most Influential Women in Technology.” Mehring was also named to the Twin Cities Business’ list of “200 Minnesotans You Should Know.” And, most importantly, a half million people now connect every day through CaringBridge to support their family and friends during a health crisis.